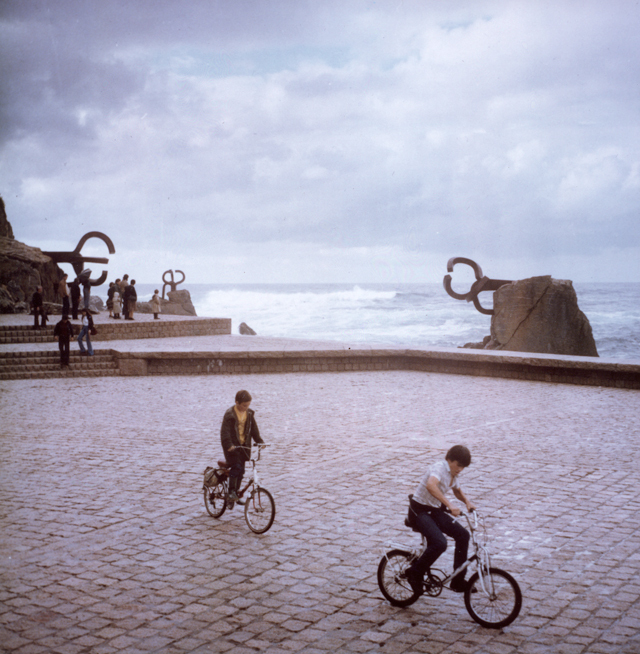 El Peine del Viento (Wind Comb), a public space built more than thirty years ago in San Sebastian, has become the emblem of the city and a place the city cannot be understood without. Situated at one of the edges of the bay at the base of the Igueldo mountain, it is visited daily by locals and tourists to contemplate the sea, the horizon, gather, and to fish and to walk. 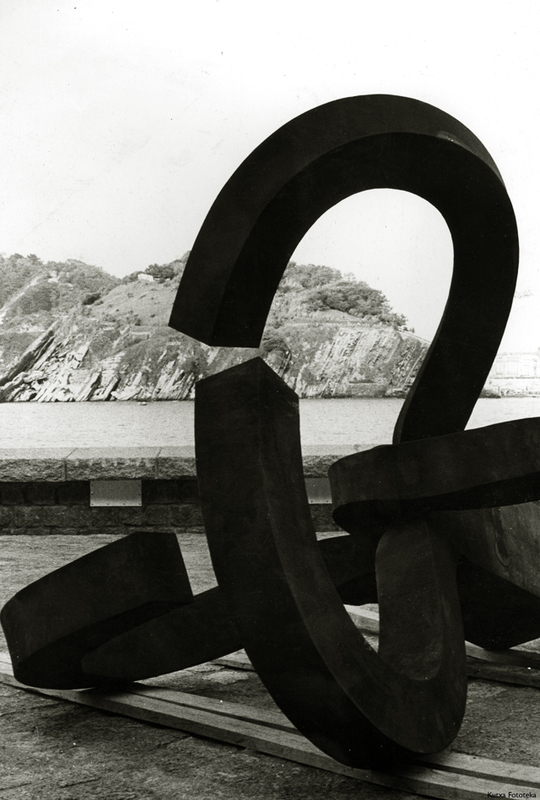 The late sculptor Eduardo Chillida (1924-2002) and the late architect Luis Peña Ganchegui (1926-2009) gave the city a place that had been waiting to be appreciated by the city. 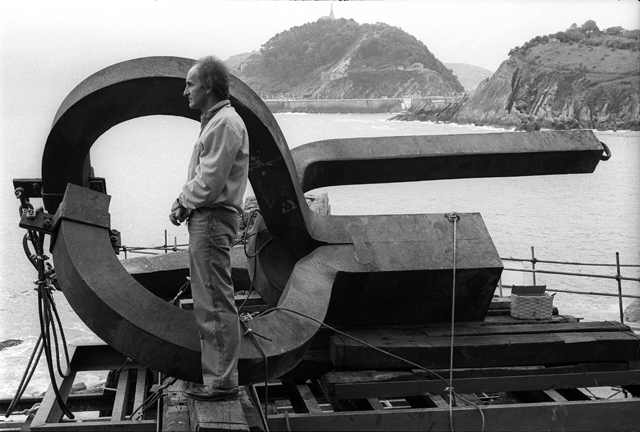 This fall, Luis Chillida, son of the sculptor, met with Iker Gil at the artist’s museum in Hernani to talk about this project. Since he was a child, the Wind Comb, at that time called “Paseo del Tenis”, was my father’s favorite place. He was a person who enjoyed being calm. It was at the end of the city and nobody was there; he would just be alone on the rocks. Instead of going to school, he would go to the rocks and watch the sea, watch the waves. He always said that he wanted to be a sailor. He loved the sea, the horizon, sailors’ stories… those were things that he was attracted to. When he started working as a sculptor in 1952, my father made his first Wind Comb already thinking about that place, thinking that at some point the city needed to regain it. It was a lost place in the city. He started thinking about ideas for that place but of course, at that early stage of his career, he could not approach anybody and say that he wanted to do something there. But in his mind, he started doing a series of studies and projects there. During the next two decades, he kept making versions of that project, about eight during the 50’s and one more during the 60’s. They were all to be located on a central rock, the first one you see when you arrive. The deciding factor to make the Wind Comb a reality was the involvement of a group of people from San Sebastián such as the owners of the Ramos bookstore, the most important bookstore, or the deputy mayor from City Hall. Outside of San Sebastián, my father’s work was recognized by this time but this group of people knew that in his own city, his work was not yet known. To help him gain local recognition, they proposed that my father have an exhibition in San Sebastián. He replied that he was really thankful for their intention, but that “an exhibition is ephemeral. It is something that comes and goes,” and that what he really wanted to do was something that would stay forever in the city. They thought it was a great idea and my father, of course, had a place in mind, a place that had to become part of the city, a place he had been thinking about for years. Site and rocks before the Wind Comb. It was after 1966 when the actual project started. It took eleven years to complete, so it wasn’t a fast process but nowadays, it would be impossible to do because of the current laws and general bureaucracy. As he wanted to adapt the space itself, the first thing he did was contact the architect Luis Peña Ganchegui. This was their first project together. My father knew his previous work and, in particular, he liked his project for the Trinidad Plaza in San Sebastián, built in 1961. They started to talk about the project as a whole. They were not to be two projects as sometimes you find, when an architect designs a plaza and then the sculptor places his sculpture. It was a single project, one part the sculptures and the other the plaza in front of them. It was a shared project on which both of them worked for years. Initially, the idea was to make one central sculpture in the first rock. 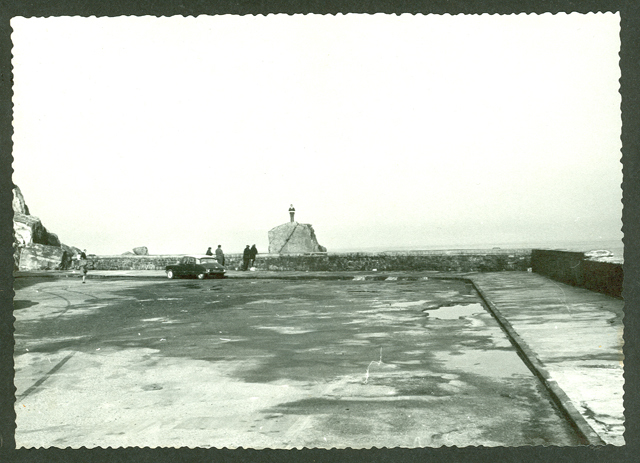 It was not until they had received all the permits to build that my father realized that a single sculpture was going to attract all of the attention and, in a way, the rest of space was going to be somehow neglected. People’s vision was going to wrongly concentrate on a single point. It was then that he started thinking about placing three sculptures instead of one. He wanted to mark three points from which the space that they define would be more important than the sculptures themselves. Three sculptures made sense for him in terms of time: past, present and future. From observing the site for so long, he realized that the stratum of the Wind Comb is the same as the one of the Urgull Mountain and Santa Clara Island, this last one a little inside the bay. In theory, those rocks had been a single rock that, through erosion, had separated. The central part, the one that creates the island, was the hardest one and the water went to the sides, forming the bay. 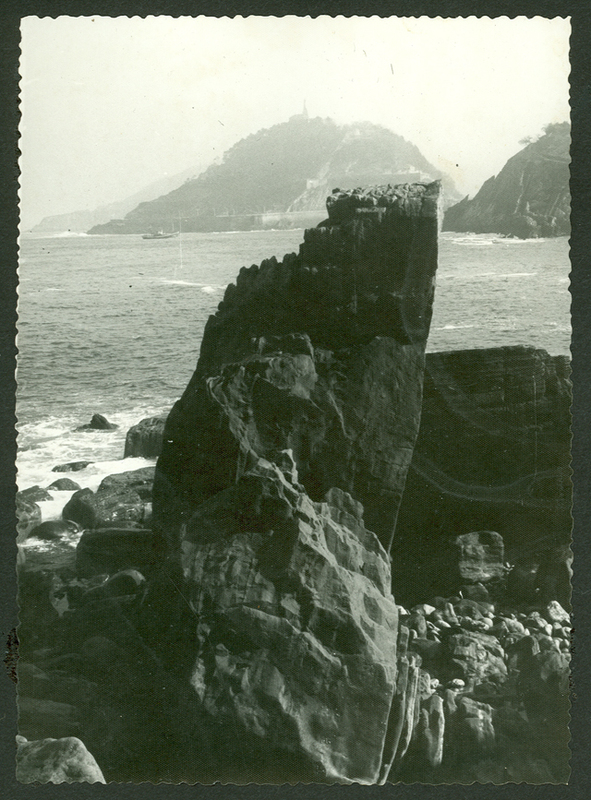 It was then that my father started thinking about two of the three sculptures, the one that is on the rocks of the Igueldo mountainside and the one on the first rock that you see when you arrive. Those two sculptures are searching for each other, trying to link to what was previously connected: the past and the present. And then he wanted to define a point that would take us beyond this place, the horizon, the future, what is going to come. That is the third sculpture, the one furthest from us. For my father the horizon was the motherland, what we have in common. Water sprays at the Wind Comb. He felt the main aspect should not be the sculptures but the sea, the air, the wind, the waves, the rocks, the stratum. This place needed to be appreciated, and with his work, he gave prominence to what already existed there. In reality, that was his way of working on any project. When he was working on a block of granite, he was letting the granite behave naturally. And this is the same as the way he worked with steel. He did not try to dominate a material, but work with it. So trying to impose something that did not belong to the site was not his way of working. He wanted this natural space that he had loved and observed to be the true protagonist of that place. The Wind Comb is a very calm place, without cars, without noise… the true noise is the one coming from the sea. The other noise is the one generated by the water sprays on the plaza that dissipate the pressure of the water below. There used to be a water collector in that area, where the water of the sea would go inside and instead of closing it, they provided an exit for it. They created seven symbolic holes representing the seven Basque Provinces. At some point they wanted the sprays coming from the holes to produce music, so they worked with the composer Luis de Pablo to see if the sound could actually produce musical notes. But it was impossible. Each wave is completely different and so is its pressure. In the end, the sculptures helped us to pay attention to the place. Before the sculptures, there was already a place, but there was a house in ruins, trees, lawns… nobody paid attention to those things, but they were here. Now, when people come to this area, they say that is a marvelous place where they feel really comfortable. And that is because Eduardo made something so people would pay attention to it. It is not only a place where the sculptures are located. The site becomes the place. 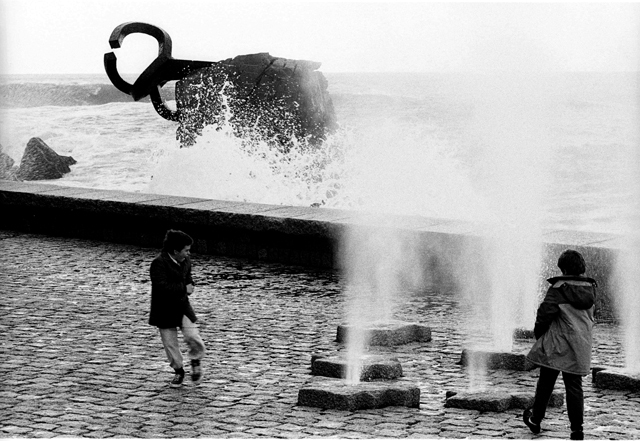 Eduardo Chillida at the Wind Comb. I spent a lot of time with my father in the factories along with the workers. He was a person who accumulated a lot of people around him, people used to doing mechanical work, repeating the same task, like building the crank of a ship. It had to be exact, precise; each movement was calculated, studied how it had to be. However, when they worked on a sculpture, the most important thing for my father was that the material was worked right at that moment, that the material expressed itself and that not everything was under control. For him, the work of an artist was something closer to the world of the unknown than the known world. Of course, you needed a technique to work in a factory and you needed tools, but for him, the moment in which you didn’t know what was going to happen, that was the moment of creation. One of sculptures waiting to be installed. A lot of people think that before making a big sculpture, there are models built, or that molten steel is poured into a mold, but that’s not the case. The sculpture has been worked on directly, fighting with the material. My father’s process was to work in the unknown. There was a moment in which neither the engineer was the engineer nor the crane operator was the crane operator… each one gave his opinion. Suddenly someone would say, “If I pull from here and you grab it with the press, then we can do what Eduardo wants. Let’s try it”. The sculptures could not be created as a single piece because the technology was not available. They were built in two parts that then were connected. And there is a curiosity about this. Inside one of the sculptures, between the two steel parts, all of the workers who had been involved in the project signed their name. All of them signed their name, because in the end, all of them had been involved in the project. They all had a role in the creation of the work. Now they come to the museum and tell me, “ I have a sculpture in Washington, DC, I have a sculpture in Berlin…” And I think this was one the great qualities of my father. After something had gone right, my father would always take the workers to have lunch to celebrate the success, to celebrate that they had reached a point they didn’t think they could reach. My father always said that the sculpture belonged to him while he was working on it. Afterwards, when the sculpture was finished, it belonged to the rest of the world. It was no longer his. The moment of the creation was when he was thinking about it and working on it. When he finished it, that sculpture would start its own life and he would concentrate on the next one. 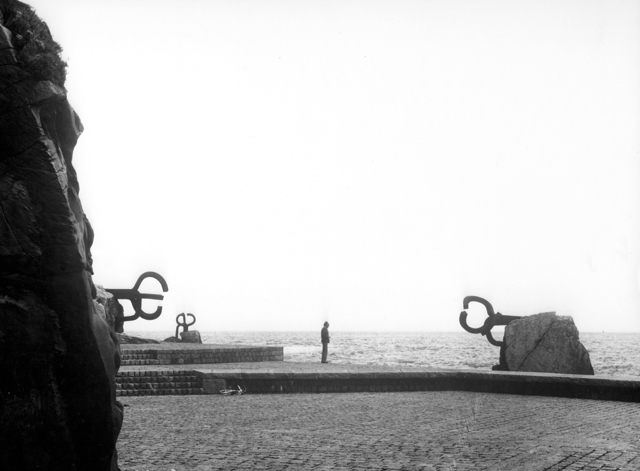 Eduardo Chillida and one of the sculptures. For the 70’s, it was a really technically complicated project. It was a project in which big sculptures needed to be placed in rocks with working conditions that were really difficult: tides, storms with strong waves, working without the type of cranes we currently have, and, in general, working without much of the technology available nowadays. In this regard, it was critical to have the involvement of José María Elosegui, the engineer of the Gipuzkoa Provincial Council. He was a friend of my father since he was a child. They studied together in Madrid. With him, he started to study how to place the sculptures in their final location. To be able to place them correctly, they had to maintain them in a very specific position in order for the composites to stick to the rock. 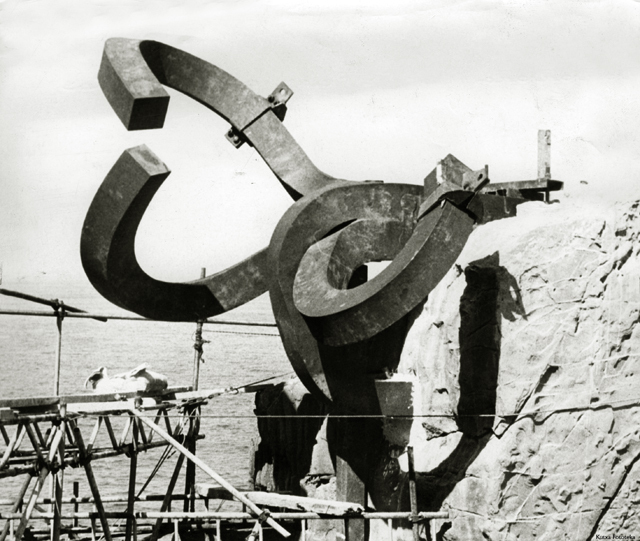 Each arm of the sculpture had to penetrate over three feet into the rock, with minimal technical means. Installation of one of the sculptures. They started to think about ideas of any kind to solve this problem. One was requesting a “Chinook” helicopter, the ones with two propellers, from the US Army to carry the sculptures and place them from above, especially on the furthest rock. But this was not a viable solution, as the helicopter pilots could not stay in the same place for the amount of time needed. Another idea was to lower the sculptures through the side of the Igueldo mountain with pulleys, but that wasn’t feasible either. Another one was to use a barge, but they couldn’t get close enough to the location because the area is really shallow, with a lot of rocks and strong waves. So they looked into more traditional techniques and finally, they proposed to build a temporary bridge. They talked to ULMA, a really important company nowadays that produces scaffolding, but at that time it was just starting. They talked to them to see if there was a way to build a bridge that could reach the final location of the sculptures and that could have rails so the sculptures themselves could be carried with carts similar to those used in mining. My father did not want to leave any type of mark on the site and if they were to make a bridge out of concrete, it would mark the site where it was built. 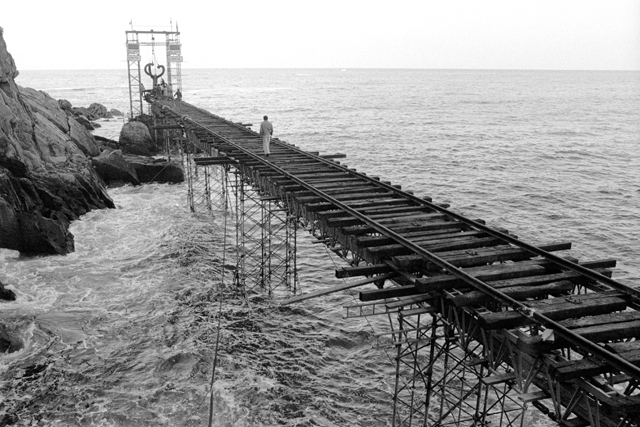 So they created a bridge made out of a tubular structure supported by small concrete feet that were later removed. But it was a relatively weak structure that moved with the waves. The day that they placed the sculpture the bridge creaked everywhere. Nobody had the absolute certainty that they were not going to fall into the water. It was a little risky, but they did a great job and they were able to transport and place the sculptures the way they wanted. Without leaving a mark. Installation of one of sculptures. My father liked the Wind Comb because he liked to be calm by the sea. The Paseo Nuevo (New Seafront), on the other side of the Bay, is more impersonal. It is called New Seafront because it is rebuilt often as a result of being continuously damaged by strong waves. It is an artificial seafront constructed over the coast and has that useful quality that the Wind Comb does not have: parking. It is a place where people park when they go to the Old Town. It is a really nice area but it is not a place were you simply go to stay. There was a time in which my father was a little embarrassed going to the Wind Comb because people would recognize him and say hi to him. So he decided to go early in the morning. He liked to get up early, he liked to think in the morning and since we went to live in Igueldo in 1982, he would go before dawn, to see the sunrise from there. Fishermen go to the Wind Comb at that time to fish. He always said that it was really quiet, you could only hear the waves, and he enjoyed being there with the fishermen. People at the Wind Comb. It was a project that, at the time it was constructed, was forward-thinking and risky. If you check the newspaper archives of that time, people did not understand the project. “They are going to place some steel rods in the rocks? Why don’t they make parking for the beach or a cafeteria?” The society of that period was different from the one that came after and, above all, modern art was something that was not understood by the people of that time. So nobody wanted to be associated with the project, and the Mayor did not want to get himself into trouble. The Wind Comb was never officially dedicated when it was finished. My father said, “I actually don’t care. It’s been dedicated by the wind, the waves, people walking… why does anybody have to come to officially dedicate it?” So they never made that official dedication. They just removed the fences and people started walking over there and from that moment, it became a place. But in 2007, on the 30th anniversary, with my father having already died, we decided to dedicate his project. In the end, it was the project itself that convinced the people of its own worth. Everybody feels that they are part of this project. It has become the emblem of the city, the image of San Sebastian. If you do a project and people don’t like it, they will always question it, but if you make it right, people will embrace it. Luis Chillida is the director of the Department of Communications, Marketing and Friends of Museo Chillida-Leku, as well as a member of the Executive Committee and the Board of Directors. From 2000 to 2004 he was the director of Museo Chillida-Leku. He raced motorcycles and cars from 1988 to 1997.